Skip-the-line tickets are almost essential to see the Vatican Museum with Sistine Chapel and the Colosseum while tours get priority access at St Peter’s Basilica. Although tickets are still sold on site at the Vatican Museum and the Colosseum in Rome, online time-slot admission tickets are the only sensible way to skip-the-lines at these popular sites. Even for St Peter’s Basilica, a guided tour is a good option on a busy day to receive priority access at the notoriously long security checkpoint queues. Skip-the-line timeslot admission tickets are the only sensible way to see the Vatican Museum and Sistine Chapel. The very small surcharge is absolutely worth it to avoid queuing in line for hours. 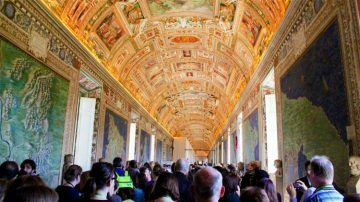 A great option to see especially the Sistine Chapel is to take an early morning or evening guided tour but these come at a price, especially for the fantastic Wake-up-the-Vatican tour when the museum and the Sistine Chapel actually are empty. Guided tours are a good option for fast access. Many use routes available only to tours to reach the Sistine Chapel faster and without the crowds inside the museum – the Sistine Chapel is still likely to be packed though. Tour members may stay inside the museum until closing time while some use the quick entry door to St Peter’s to skip the long security lines. See Buy the Best Skip-the-Line Tickets and Tours to See the Vatican Museum and Sistine Chapel for more information. The Sistine Chapel is included in all Vatican Museum tickets – there is no separate ticket or time-slot for the Sistine Chapel. 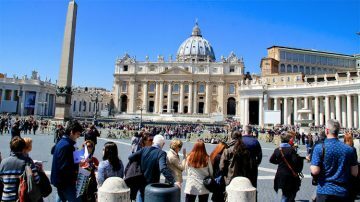 Although admission to St Peter’s Basilica in the Vatican in the heart of Rome remains free, skip-the-line tour tickets are a good idea to enter the church fast on busy days when security line queues may be long and slow moving. The cheapest option is usually an official audio guide tour – this gives members direct access to the front of the security lines. Standard guided tours also give members access through dedicated security lines. These tours may be combined with further Rome tours or with the Vatican Museum – such tours usually start at the Vatican Museum and then use the special door after the Sistine Chapel to enter the St Peter’s basilica complex without having to go through security again. If visiting St Peter’s without a tour ticket, it remains very sensible to arrive first thing in the morning. This is especially important if planning to climb the dome or visiting the crypt as it may involve further queuing later in the day. 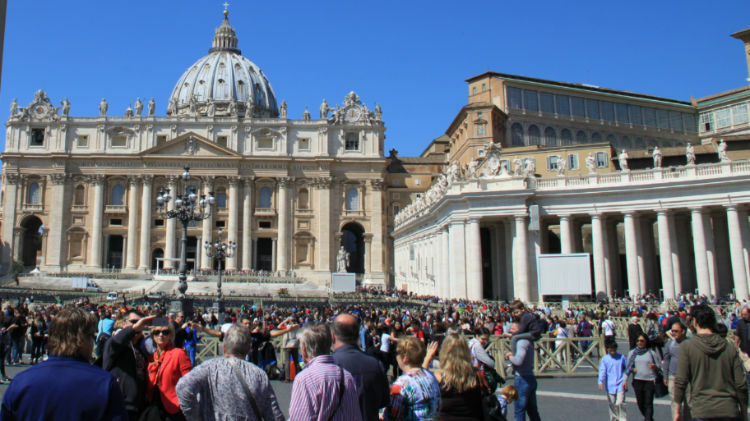 See St Peter’s Basilica in Rome on Skip-the-Line Tickets and Tours for more options. See also Top Sights in Italy Require Advance Reservation Skip-the-Line Tickets for more popular tourist attractions in Italy that either require advance reservations, e.g. The Last Supper in Milan, or where time-slot tickets are a very wise investments, e.g. to enter the Uffizi gallery in Florence. Time-slot reservations and skip-the-line tickets are increasingly available for top sights in Europe. Some sites require advance reservations such as the Sagrada Familia in Barcelona while the Anne Frank Huis and Van Gogh Museum in Amsterdam only sell tickets online – no queuing or purchasing of tickets at the museums at all.